We know dogs as our friend, family member or even as police dogs. But, do you know they have been serving humans as therapy assistants, too? Canine therapy is the guided interaction between a person and a dog with the goal of comforting and increasing joy in a person with mental or physical health condition. The patients may learn to give command to the dogs, play with them or pet and care for him. Therapists observe their actions and behavior with the dog and use them for in other situations and further treatment. Question might raise, why to use dogs for therapy when there are well educated and experienced people in therapeutic interventions? Like other animals, dogs are comforting, accepting and non-judgmental. Canine therapy is particularly beneficial when the patient is resistant to treatment and struggles for verbal communication. It's also very useful in treating children and teenagers with problem in focus. Any dog can be a therapy dog as long as s/he is well tempered, obedient, well socialized and loves to cheer others up. 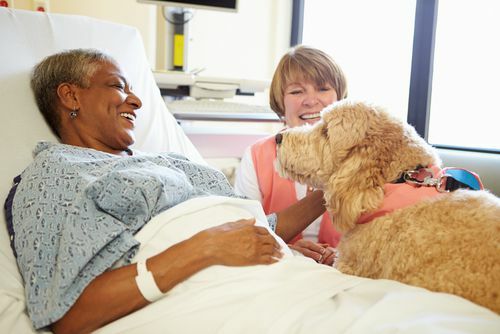 Therapy dogs undergo extensive training before working with patients. They work with the people with special conditions, for example people with learning difficulties, in special places such as, hospital, nursing home, hospices, schools, stressful conditions and disaster areas. Generally, there are three types of therapy dogs. These are household pets. The pet guardians make time to take them to place of need in scheduled times. Patients in nursing homes or rehabilitation centers love to play with them. The visitation from their canine companion brightens up their day, comfort them and motivate them to uplift their self esteem. These dogs usually live in rehabilitation centers and assist physical and occupational therapists. They are a major part of the therapy and each of them have goals in individual's recovery such as, gaining motion in limbs, hand-eye co-ordination and fine motor control. These dogs are trained particularly to work with the patients with Alzheimer's disease or other mental illnesses in nursing home. They live in the facility and are handled by trained member of the staff. Anyone can benefit from dog's companionship, their unconditional love and care. Being with them for just some minutes is enough to overcome a whole day of stress and tension. Likewise, or more, people with special mental or physical conditions have been benefited by therapy dogs in many streams. Who Should Consider Canine Therapy? While uncommon, safety can be an issue with canine. If used unsuitable dog, it can harm the patients. On the other hand, risk is always there that the patients with mental condition and bad temper can harm the dog. The handler and guardian should always be careful about sanitation and cleanliness of the dog. Some people might be allergic to dog dander, which can some time create serious medical issue. People tend to be attached to things easily. Sometimes, the patients refuse to be detached from the canine companion. This sometimes, leads to low self-esteem and depression.